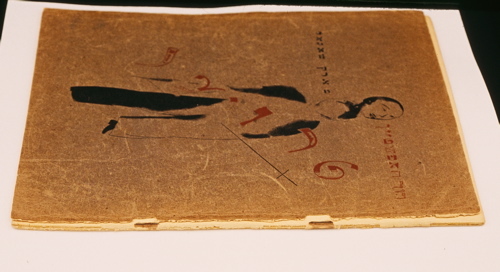 After the Revolution of 1917 in Russia, the ban on Yiddish and Hebrew publications was rescinded, and many avant-garde artists (including El Lissitzky, Natan Altman and Chagall) illustrated Yiddish poetry and journals. Chagall created the cover, title page and 6 illustrations of “Troyer”, which is a book of poems that reflect upon the struggle of the Jews in the Ukraine during the recent Civil War. Chagall’s illustrations–empty villages, funerals and gravestones–evoke the emptiness and loss that he was feeling in his own life, having just lost the position as head of the Vitebsk Popular Art Institute to Malevich. This was one of the last projects he worked on in Russia, before leaving. The conservation problems was seemed fairly straightforward; the front cover was detached, the staples were rusting and causing damage to the paper and the paper itself was quite fragile and brittle. There was surface soiling to the text and numerous small tears. But because this belonged to a dealer, the treatment discussion raised some interesting points concerning custodianship. I prefer this term to ownership, because it highlights the temporal nature of our relationship to the objects that we have acquired– in most cases they will outlast us. A dealer has a very short period of custodianship– he acquires a piece in order to sell it. Collectors purchase objects for a variety of reasons, sometimes to flip them at for a profit in a short time, often to keep them longer. Institutions tend to keep objects the longest, but that is changing. This dealer wanted the cover reattached in order to sell the book, but the acidic paper and rusting staples were also causeing damage. I often counsel dealers to do as little as possible, and in particular avoid superficial aesthetic repairs that could mislead potential buyers to the actual condition, and let the purchaser decide what is the best for the object. If a the purchaser of this book would come to me at a later date, I might recommend removing the staples, repairing the damaged areas, and replacing them with visually similar but chemically inert replacement- such as painted thread of the same dimensions. And once the staples were removed, a more careful examination of the paper could take place and other possible treatments considered. If an institution purchased the item, they might want a different approach– removing the staples and leaving it in that state for display of all the Chagall illustrations, for example. This would solve the problem of the active deterioration around the staples and allow considerations for future treatment options to take place at a later date. Experiments could take place in developing an isolating layer around the rusting staples that would allow them to be replaced without causing further damage. For every item, there are a variety of treatment possibilities that meet the AIC’s Code of Ethics and Guidelines for Practice. Sometimes treatment decisions are driven by the larger context in which the item resides, not for reasons inherent to the object itself. In this case, very delicate minor hinging was done, bridging the torn paper under the staples, without detaching or disturbing them and reattaching the front to the back cover. The text was lightly surface cleaned and tears repaired. In this situation, choosing the least invasive treatment route kept all the physical information intact for the next custodian to determine what was best for the object. 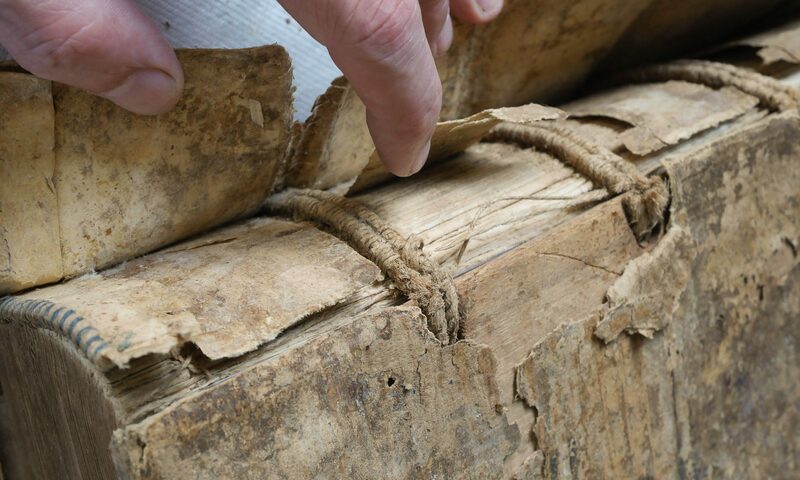 It is the conservators duty advocate for the object, attempt to preserve all the information that it contains, and not to pass judgement on what is, or is not considered valuable in the current intellectual climate. The term “custodianship” is very enlightening concerning our relationship with the objects, although i am not sure about the proper translation in Greek. Sometimes I find it very difficult to persuade the person who brings the item for the least invasive treatment.